7. We finally come to the head. The area where the bill joins the head is made using the round file. The cut starts at the top of the bill and is cut down and toward the back of the head. The bill has a triangular shape with a rounded bottom.With the flat rasp you can then shape the rest of the head. 8. Remove the file marks by sanding, using 220 or 240-wet/dry sandpaper. This sanding is done wet. Hold the carving in one hand, wet the carving and the sandpaper in a container of water and begin sanding the carving with the sandpaper. 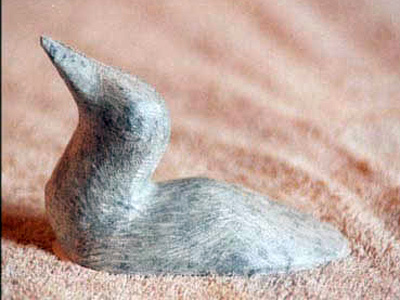 The white mud that develops can be rinsed off in the container of water. 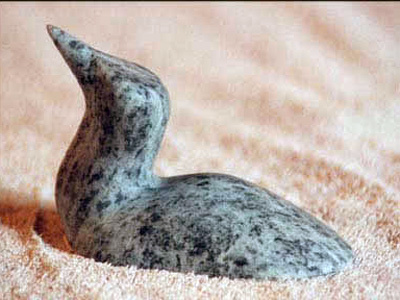 Hold on to your carving as wet, smooth soapstone can be very slippery.